From Valparaiso we were joined by Guest Educator Teatahero Tuki. Born on Rapa Nui (Easter Island), from the age of 9 he was greatly interested in the traditional songs and dance of Rapa Nui, and today carries on the cultural legacy of the island through his own performances. In addition to this, he studied tourism and now works as a tour guide guiding visitors to the island and introducing them to the language and culture of Rapa Nui. In his first lecture “Island of the Moai: Rapa Nui”, Teatahero introduced the mysterious statues known as Moai, of which there are approximately 1000 all over the island, as well as the still undeciphered language Rongorongo. The question still remains of what culture exist previously existed on the so-called “Lonely Island”, located 2000km from the nearest populated landmass. Rapa Nui continues to have the power to bewitch people with its mysteries. 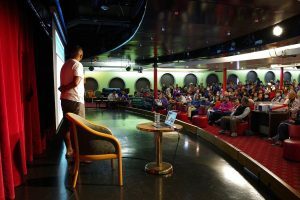 Teatahero said that speaking on Peace Boat has been a long-time dream of his, and in his packed lectures many people waited with baited breath to hear his story. The name “Easter Island” was given by the first Europeans to discover the island, after Dutch sailors came across the island on Easter Day in 1722. 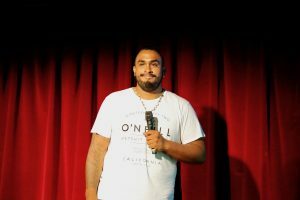 For the local people, the name “Rapa Nui” means “big island”, and in Teatahero’s lectures he introduced some of the sights and history of the island, the mystery of the Rongorongo language, as well as some basic greetings in the local language. For Teatahero, the time he spent onboard flew past, and he said that “it makes me so happy to know that people are interested in learning about the culture and history of my island”.